I grew up in Los Gatos, California and studied Business Economics at the University of California, Santa Barbara. After graduation, I became a Certified Public Accountant (CPA) and spent most of my career in finance working as the Chief Financial Officer (CFO) for a variety of Silicon Valley startups and as the CFO of a San Francisco venture capital firm. I started Kundalini Yoga after a relationship breakup in 2007. Prior to that, I had little interest in yoga—I was a surfer and a runner and found yoga boring. I started Kundalini Yoga to feel better, and eventually went on to do teacher training. In 2012, I moved to Greece. I had no reason to move. I just got this very clear feeling, like a calling, I should be in Athens. I came to Greece twice in 2011 as an experiment, and I moved in 2012. I’m a Kundalini Yoga instructor, and I teach a system of psychology called the Enneagram. I’ve written a book called “Headstart for Happiness” that combines the two systems, and I’m currently writing a second book on using both systems, with an emphasis on personal relationships. 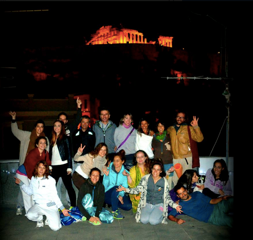 During the summer, I teach donation-based Kundalini Yoga classes on my roof deck right under Acropolis. The views are amazing and, when the group comes together, the classes are magical. When I moved to Greece, I thought I was going to need to start all over and figure out a new way to earn money. However, at the last minute, one of my major clients decided they were ok with me working remotely so, for the first three years of my new life, I was the CFO of an interactive agency in San Francisco while living in Athens. After three years it became very clear in my mind I needed to stop doing the finance work. 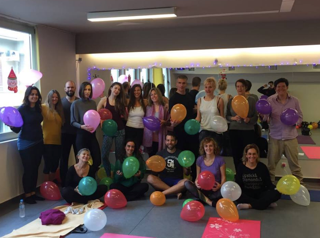 It was at this point that the yoga classes gained momentum, I wrote my first book and other opportunities started to present themselves. I think it is difficult to make a comfortable living following the traditional “yoga instructor” business model. My model is different: I believe in the power of multiple revenue streams. I have my donation-based yoga classes, yoga workshops and retreats, as well as two Airbnb apartments in Athens and one in San Francisco that I rent out, plus my book sales. I think it is important to manage financial stress. I like multiple revenue streams because it makes me less dependent on yoga for my income. I also think this lets me teach the practice with more purity. In the beginning, my yoga classes were nearly empty. Then I got lucky and met someone who believed in me and the yoga style I teach, and she helped create a interest in my classes. Having modest expectations helped me a lot because everything has taken much more time to develop than I might have expected. I have realised that you build the best base one person at a time. Celebrate every single victory every single day. It makes the journey much more fun. Everything takes longer than you expect and requires more energy and effort. Grit and determination are often more important than your raw talent. You’ll know you’re on the right track if you feel energized and excited to start each day. Don’t get too caught up in what other people are thinking. Your conscience isn’t rule by the majority. No one becomes successful on their own so don’t be afraid to ask for help.